Safety and functionality are not compromised for style with each shower featuring our easy to clean gelcoat fiberglass “tile look” finish. Our handicap showers are available in a full range of sizes and threshold heights that can meet the safe bathing needs of private residences, senior care and assisted living facilities. Safety and functionality are not compromised for style with each shower featuring our easy to clean gelcoat fiberglass “tile look” finish. All handicap shower walls include full plywood backing to structurally support the installation of grab bars and shower seats. In addition, shower pans with a threshold lower than 1.25” are reinforced with steel studs. All of our shower pans have an anti-slip finish and are pre-leveled at factory. Our multi-piece shower walls contain innovative leak-proof snap joints that allow for a trouble-free installation. All of our showers are backed by a 30 year limited warranty. 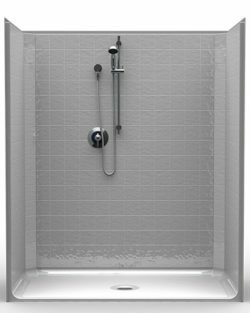 Beautifully durable, our Handicap Showers add piece of mind to your home. 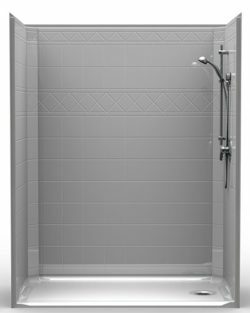 Our handicap showers are available in walk-in, roll-in, and ADA compliant models. Each shower is crafted with your specific needs in mind. 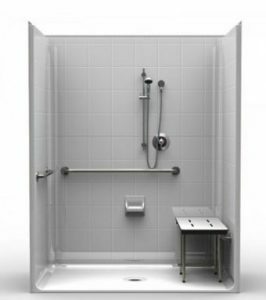 Our ADA compliant handicap showers meet all ADA accessibility and safety guidelines. 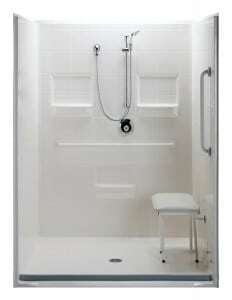 Each of our handicap showers are commercial quality and set the standard for beauty, durability, and safety. Our full line of low-threshold and roll-in showers will meet all of your residential or new construction project requirements. In addition, all of our handicap shower models are beautifully white and elegant giving your bathroom a newly refreshed and modern look. 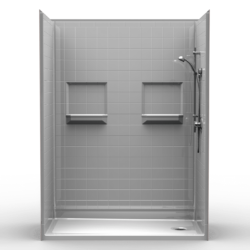 Depending on the size, each handicap shower stall and roll-in shower is available as either a one-piece or multi-piece unit. 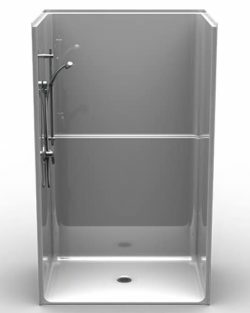 Our one-piece shower units are perfect for new construction projects because they have the option to come with pre-installed shower accessories. Our one-piece handicap shower units are the perfect solution for new construction because of how easy they are to install – all you need to do is set the unit in its bathing pocket and hook up the plumbing! The ease of the process will save you time and money. If you are renovating an existing bathroom or facility, our multi-piece units are the perfect solution. All of our multi-piece handicap showers feature our innovative leak-proof snap-joint system to aid installation and support a multitude of accessories. 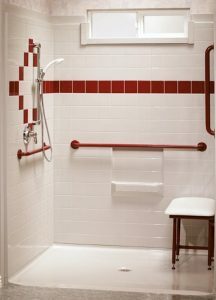 A handicap shower allows people with limited mobility to enjoy the same ease of access afforded to everyone else. Our handicap showers are available in different package options that are fully accessorized to aid in mobility and are the perfect solution for your remodeling or new construction projects. We have multiple models and configurations to suit every individual need. If you are unsure about your specific needs, our bathing specialists are always happy to help and find the perfect shower solution for you. Our handicap showers not only provide you with safe bathing solutions, but also allow you to update the look and feel of your bathroom. 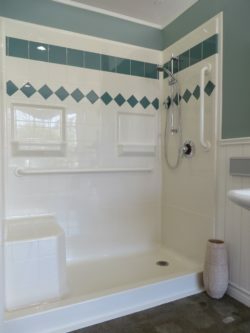 People of all abilities will enjoy the look and feel of your new shower. The fiberglass gelcoat finish looks just like traditional tile, but has the added benefit of being easier to clean. In addition, we also offer custom color options with our designer showers. You can choose to color a section of the tiles on the gelcoat fiberglass walls for that unique accent tile look.